South African Airways (SAA) is planning to expand its regional international network further as the flag carrier reduces its focus on the domestic market and tries to turn around its highly unprofitable long-haul operation. SAA is increasing capacity to several existing destinations in Africa and plans to launch more new regional international destinations by the end of 2014. SAA also still hopes to open a base in West Africa, which is a key component of the carrier’s new business plan and will enable several destinations to be served which would not be viable non-stop from Johannesburg. SAA is also looking at growing its budget brand Mango in the African market through potential joint ventures. But the group expects Mango’s existing South African operation to focus mainly on the domestic market, which SAA views as becoming increasingly price conscious and therefore unable to support its mainline full-service product - with the exception of the two main trunk routes. This is the third and final part in a series of analysis reports analysing SAA’s new business plan and outlook. The first two instalments looked at SAA’s strategy for turning around its long-haul operation, in particular the possibility of a tie-up with a Gulf carrier and the plans for renewing its widebody fleet while introducing a premium economy product. SAA has been focusing expansion on the African market for the last several years. The continued focus on Africa makes sense as South Africa’s regional international market remains relatively underserved and SAA’s African operation has been the only part of its business which has been consistently profitable. Demand for services within Africa meanwhile continues to grow rapidly as ties between African countries become stronger. Traffic figures from the fiscal year ending 31-Mar-2014 again show the focus on Africa. SAA says passenger traffic across its regional international network was up 5% year over year while domestic traffic was down 2% and long-haul international traffic was flat. SAA will report full traffic figures for FY2014 along with its financials in Sep-2014. SAA currently serves 38 international destinations within Africa (includes some destinations in southern Africa which are operated by regional partners Airlink or SA Express), according to OAG data. 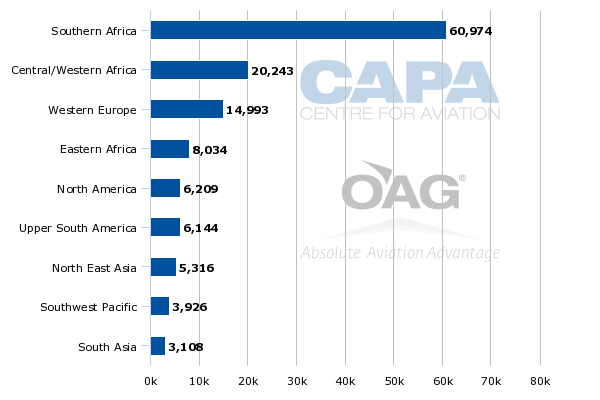 Nearly three-quarters of SAA’s current international seat capacity is allocated to the African market, including about 47% within southern Africa. SAA has steadily expanded its African network in recent years. In FY2013 SAA added six African destinations: Abidjan in Ivory Coast, Brazzaville in the Republic of the Congo, Bujumbura in Burundi, Cotonou in Benin, Kigali in Rwanda and Ndola in Zambia. The carrier ended FY2013 with 26 international routes within Africa (SAA mainline only). SAA reported an operating profit for its intra-Africa international operation of about ZAR800 million (USD75 million) in FY2013, marking at least the fifth consecutive year of profits. SAA did not add any African destinations in FY2014 and actually shrank its African network as Bujumbura and Kigali were dropped in Dec-2013, only slightly less than a year after they were launched as part of a Johannesburg-Bujumbura-Kigali routing. But SAA’s intra-Africa capacity again increased as frequencies were added during FY2014 to several existing destinations including Accra, Dar es Salaam, Ndola, Lusaka and Windhoek. Since the beginning of calendar 2014 SAA also has increased capacity to Abidjan, Blantyre and Nairobi. SAA CEO Monwabisi Kalawe says, “new destinations to Africa will follow shortly”. SAA’s new business plan also envisions a second hub in West Africa, which would be used to open up secondary destinations in the region and enable the group to accelerate growth in the intra-Africa market. While Johannesburg is well positioned as a hub for services within southern Africa, West African cities are better positioned geographically for a larger chunk of the continent. SAA’s new business plan, which was completed in early 2013, listed three potential West African bases – Nigeria, Ghana and Senegal. SAA has since evaluated prospects in all three countries and has ruled out Nigeria and Senegal. Mr Kalawe told CAPA that Nigeria was excluded as SAA concluded the infrastructure was insufficient to support a potential hub. But he says potential partners in Nigeria continue to knock on SAA’s door. While SAA may end up relooking at Nigeria if Ghana also falls through, the recent instability in Nigeria would obviously be a concern. There is also a potential lack of suitable carriers to partner with and the infrastructure constraints certainly remain. Mr Kalawe says Senegal was excluded after SAA concluded an investment in potential partner Senegal Airlines would not be viable. An assessment and due diligence of Senegal Airlines was made in Senegal by a team consisting of officials from SAA, SA Express and the South African government. Air France and Ethiopian Airlines also reportedly responded to a request from the Senegalese government to consider an investment in its flag carrier, which has been restructuring and recently returned its A320 fleet. For now the only option on the table is Ghana. Mr Kalawe says an SAA team is planning to visit Ghana by the end of Jul-2014 to assess the viability of an Accra hub. The upcoming evaluation will include an assessment of potential airline partners in Ghana and neighbouring countries. SAA is not interested in establishing an overseas hub without a partner and prefers to find an existing carrier rather than start a new joint venture carrier from scratch. ASKY Airlines is one potential partner which has been identified by SAA but Mr Kalawe insists it is not the only potential partner for an Accra hub. ASKY is currently based in neighbouring Togo but has been looking at establishing a second hub in Accra or moving its current hub to Accra. Ethiopian currently owns a 40% stake in ASKY and has been providing technical and management assistance. ASKY’s fleet of three 737-700s and five Bombardier Dash 8 turboprops are all registered in Ethiopia, with the Dash 8s also owned by Ethiopian, according to the CAPA Fleet Database. SAA sees the possibility of Ethiopian, SAA and ASKY jointly establishing a regional hub in Accra. But ASKY reportedly has said it is not interested in an investment from SAA and has no plans to discuss any potential investment with SAA . A tie-up with ASKY and Ethiopian would be logical. Ethiopian is a codeshare partner of SAA and the two carriers are both members of the Star Alliance. ASKY is seen as potential new member of Star as Star currently does not have a strong presence in West Africa. Other Star carriers such as TAP Portugal would like to see ASKY establish a hub in Accra as Accra is served by more Star carriers than Togo. Accra is served by six Star carriers while Lome in Togo is only served by two, Ethiopian and Brussels Airlines (which operates two weekly flights to Lome via Abidjan). ASKY and Ethiopian combined account for about 70% of total seat capacity at Lome. SAA is now the sixth largest international carrier at Accra. EgyptAir, Ethiopian, Lufthansa, TAP and Turkish Airlines also serve Accra. Accra would make an ideal regional hub for Star (or other global alliances) as well as for Ethiopian and SAA. Ethiopian could potentially move its Sao Paulo service, which is now routed via ASKY’s hub in Lome, to Accra. SAA could also potentially move its Washington DC service, which is now routed via Dakar, to Accra and stop some of its New York flights in Accra. Accra is the tenth largest international airport in Africa based on current seat capacity. But it is the largest without a local hub carrier (all Ghanese carriers are entirely or predominately domestic operators), making it particularly attractive to another African carrier keen on establishing an offshore base. But SAA’s prospects in West Africa would be dealt a huge blow if ASKY and Ethiopian decide to pursue an Accra hub without SAA. The Ghana market is unlikely to support international hubs from more than one player. There is also a limited pool of suitable partners in Ghana and neighbouring countries. Ethiopian has already emerged as the largest airline in the intra-Africa market. Combined with ASKY, the Ethiopian group now has about 120,000 weekly international seats within Africa, compared to almost 90,000 for SAA and slightly over 70,000 for Kenya Airways. SAA is keen to increase its share of the intra-Africa market. But SAA has a relatively conservative approach, having learned its lesson with previous failed investments in smaller African carriers. Africa will remain a key part of the group’s strategy, with Mr Kalawe calling it “our growth engine”. But growth in Africa will not be pursued at any cost. SAA also has potential options to expand in Africa using its low-cost subsidiary Mango. Mango is predominately a domestic operator and has just one international route, linking Johannesburg with Zanzibar in Tanzania. The group at least for now does not have plans to use Mango to significantly expand in South Africa’s international market but is interested in using Mango to establish joint ventures or affiliates in other African countries. Mango however would likely be primarily a domestic brand in markets such as Nigeria. As a result a Mango franchise is unlikely to emerge as a substitute to the West African joint venture and hub that the group has been seeking to establish. In recent years SAA has already handed routes such as Johannesburg-Port Elizabeth and Cape Town-Durban to Mango. SAA’s two regional partners also have taken over some domestic routes. According to OAG data, SAA mainline currently only operates three routes – Johannesburg to Cape Town, Durban and East London (with most East London services now operated by regional partners). SAA believes the South African domestic market has become too price sensitive for a mainline full-service product to be viable on most routes. The shift of previously unprofitable routes to Mango (and to some extent SA Express and Airlink) has enabled SAA to improve profitability in its domestic operation. Mango’s profitability also has improved as SAA mainline has pulled out of domestic markets and as the LCC has benefitted from the consolidation in South Africa’s LCC sector. Mango reported a profit of ZAR39 million (USD4 million) in FY2013 along with revenues of ZAR1.36 billion (USD128 million). The handover of domestic flights to Mango also has allowed SAA to redeploy capacity from the domestic to regional international market. SAA’s narrowbody fleet currently consists of 17 A320 family aircraft and 12 737-800s with another 16 A320s on order, according to the CAPA Fleet Database. SAA plans to phase out its 737-800s by the end of 2017 as the remaining A320s are delivered. The four growth aircraft will enable SAA to continue pursuing expansion in the African market. Mr Kalawe expects all of SAA’s 737-800s will end up at Mango, giving the carrier a fleet of 20 aircraft by the end of 2017 and enabling the LCC to pursue rapid growth. Mango currently operates a fleet of eight 737s, including seven 737-800s and one wet-leased 737-300, according to the CAPA Fleet Database. Mr Kalawe says SAA will continue to be “very selective” in expanding the Mango brand in South Africa’s international market. As CAPA previously suggested, SAA should be more proactive in expanding Mango as South Africa’s short-haul international market is gradually becoming more competitive with other LCC groups including Fastjet and flyafrica.com entering. At least for now the SAA group is being defensive and prefers to monitor international routes where it is starting to see LCC competition rather than make an early move and use Mango to stimulate demand. The SAA group's attitude is tepid towards using Mango on international routes because SAA’s regional international network remains highly profitable, with almost all routes in the black and most of the new markets added in recent years meeting or surpassing expectations (Bujumbura and Kigali were exceptions). But the profits are a result of some of the highest fares in the world and of relatively low capacity levels. The profitability in some markets has started to fall as competition has increased and, with this largely irreversible trend, it is inevitable that more of SAA’s cash cow routes will progressively come under pressure. It is hard to fault SAA for moving slowly as for at least the short to medium term its regional international market will remain relatively protected and underserved. But SAA needs to think strategically about its long-term position and outlook. If SAA plays its cards right it could secure a strong position in the growing intra-Africa market, with multiple bases as well as LCC franchises in some key markets. Africa undoubtedly is where SAA has the biggest opportunities. Long-haul is always going to be challenging, with limited growth potential. SAA needs to be ambitious with its Africa expansion strategy. But above all it must have the full and consistent support of its government shareholder - or risk missing out. The shareholder's performance has to date not offered the promise of a wholly supportive role in future; that involves ensuring the capital is available for fleet renewal and avoiding the impulse to meddle whenever the political juices flow.